Ken Cuccinelli's parting gift to Democrats: An "Obamacare referendum." 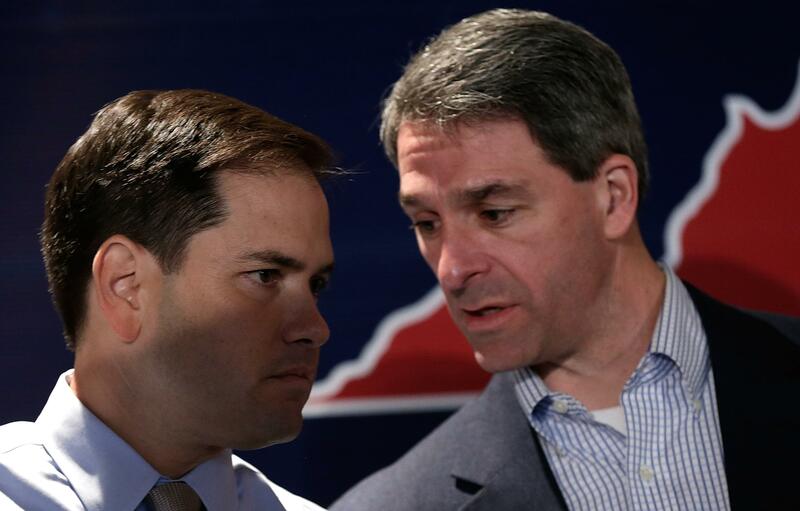 Marco Rubio, left, and Ken Cuccinelli have been doing their best to make Virginia’s gubernatorial election about Obamacare, but it hasn’t been working exactly as hoped. Bill Kristol writes in the Weekly Standard that the GOP candidate for governor of Virginia can win if the election turns into a referendum on the president’s health care law. Surely enough of Virginia hates that law to be willing to cast a proxy vote here. Kathleen Murphy, running in a competitive Northern Virginia district (mine! ), saying she believes the state should force Virginia doctors to accept Medicare and Medicare patients. This is of course a kind of extension of the logic of Obamacare. So: Shouldn’t Cuccinelli and friendly outside groups, in the final two days of the campaign, try to make the race a full-fledged referendum on Obamacare? It’s late in the day, of course. But if I controlled a few hundred thousand dollars, I would robocall and leaflet every home I could in the state, making Kathleen Murphy’s statement famous, tying McAuliffe (who’s already a big Obamacare defender) to his fellow Democrat, and making clear that a vote for McAuliffe is a vote to extend, expand, and entrench Obamacare in Virginia, and that, conversely, a vote for Cuccinelli is a vote to begin to limit, repeal, and replace Obamacare. This is a referendum on Obamacare, and to help us clarify that point, the president is coming tomorrow. I think clearly this is one of the first opportunities that Americans have had to speak out on the role of federal government in the aftermath of the implementation of Obamacare, which is hurting real people. Virginia can send Washington a message that we oppose Obamacare with our votes on Tuesday. Virginians who oppose Obamacare can vote for me, and Virginians who want to see Obamacare grow further can vote for McAuliffe. It’s not entirely wrong. But it is mostly wrong. On Oct. 17, the day the government shutdown ended, the RCP average gave Democrat Terry McAuliffe a 7.4-point lead over Cuccinelli. On Election Day, that average has shrunk to … 6.7 points. Two weeks of making this election a “referendum” has boosted Cuccinelli by less than 1 point. If the polls are right, Democrats will be incredibly grateful that Cuccinelli gave them a “referendum” and they won it.